What would give you the most time savings in an IRONMAN 70.3 or IRONMAN-distance swim? Would you say it’s the weeks of structured training and improving your cardiovascular efficiency or effectively performing open water drills and skills (i.e. sighting, pacing and navigation) more efficiently? What if I told you that small skill improvements would give you more noticeable results? Indeed, by applying the theory of marginal or small one percent improvements to every aspect of your triathlon swimming, you can get the most benefit and time savings. These are in the form of open water swim skills and drills, tips, insights and advice for improving your swim stroke and technique, not numerous hours in the pool or lake. If you can improve everything you do in the water by one percent, then the net effect is a much greater performance in the water than just cardiovascular efficiency alone. This article will help you to apply this theory to open water swimming 70.3 and Ironman. Almost every swimming habit that you have — good or bad — is the result of many small decisions over time. It takes lots of perfect practice to ingrain movements into muscle memory, and into actions where our neuromuscular system eventually enable these patterns to become automatic. For every action in water, there is an opposite and equal reaction. This can be unforgiving at times, yet when performed correctly can help propel us forward with greater ease, speed and power through the water. Meanwhile, improving by just one percent often isn’t notable (and sometimes it isn’t even noticeable). But it can be just as meaningful, especially in the longer swims of an IRONMAN or IRONMAN 70.3. And from what I can tell, this pattern works the same way in reverse. (An aggregation of marginal losses, in other words). If you find yourself stuck with bad habits or poor results, it’s usually not because something happened overnight. It’s the sum of many small choices — a one percent decline here and there—that eventually leads to a problem. So where can you find these tiny percentage improvements in your swimming technique for open water? Did you know that you can add 20 percent or more to your overall open water swim race distance by not sighting effectively or often enough? We often see GPS swim tracks where swimmers have gone further than they expected. For example, swimming 2700m in a 1900m IRONMAN 70.3 swim due to poor sighting. Sighting every six to eight strokes and checking on your navigation reference regularly is important to swimming and sighting effectively (and ensuring that you swim in a straight line). It’s best to sight on something higher like a darker tree, building, or spire, than a buoy in the water! Learning to sight efficiently while swimming in open water saves time and energy. Sight after you breathe, there’s more time for water to clear from your goggles, thus improving visibility, and less drag from pulling your head directly forward out of the water. Practice sighting off landmarks such as highly visible buildings or other structures on shore. Don’t rely solely on race buoys as they can be harder to see while in the water. In a race choose these landmarks beforehand while you’re warming up or during practice swims. Practice sighting by turning your head slightly forward either before or after taking a breath. When sighting after a breath, you are more likely to rely on peripheral vision, which will also reduce drag. Being able to maintain and control your race pace under fatigue, and maintaining your technique becomes even more important in the IRONMAN 70.3 and IRONMAN swim legs. If for example your goal is to swim 3800m in open water in 64 minutes, the pace you want to hold for each 100 meters is a 1:36 pace. You want to be able to hold this pace throughout your 1,900m or 3800m swim distance. Build up to this gradually over time, starting at 10×100, working up to 40x100m. Many triathletes wonder if they should sprint off the start line of a longer swim race. Be aware if you haven’t conditioned your body for some sprints over a number of weeks that you’ll produce high levels of lactic acid during the initial several hundred yards of the swim, and as such you may not recover for 10 to 15 minutes. That is a lot of lost time until you can swim at your target race pace again, and it is likely to have diminishing returns in your overall time. Try this swim session and see how you feel. It will make you as strong as an ox, and as fast as a cheetah using positive split intervals. 5 x 150m as 50m front crawl flat out, then straight into 100m at 80-85 percent effort with 60 seconds rest at the end of each 150m. Great swimmers have a variety of speeds, including warm up, aerobic training speeds, lactate speeds and pure print speeds. Having knowledge and an inherent feel for what these are will help you in swim races, and in particular knowing whether to sprint in mass starts. By learning what your race pace is (and how to hold onto it), by making minor adjustments to your technique, by drafting and sighting well, you can create valuable savings in the water. One way to check if your pacing is on target is to see if you can do even splits (+/- 3 seconds) over 15 x 200 meters free at your race pace with 60 seconds rest in between. Work up to this pacing test over a few weeks. Do you feel like you lose your way a bit when turning around buoys in open water? Or, when you’re racing, are you filled with dread at the thought of being punched and kicked just as you’re about to breathe? Try swimming slightly wider around the buoy away from the corner where everyone tends to congregate. Practice turning around the “T” at the end of the lane in the pool first, then progress to open water. You’ll need to sight straight after your turn to re-align with your navigation point ahead quickly. Depending on the race course, you may end up performing up to four or five turns around a buoy or other non-moving object in the water. You should be practicing to use these pace changes to your advantage. Choose an object in the water to practice turns. When approaching the turn, you should transition to one-side-only breathing with every stroke. The side you breathe on needs to be facing whatever object you are turning around (another sighting drill). Try to cut the turn as close as possible, which may require you to use short, choppy strokes. Practice transitioning from a tight, choppy turn back into a long, relaxed glide, as you would do in the race. Go for eight to 10 turn repeats. Also practice doing “Crazy Ivan” turnarounds in open water, where you turn a full 360 degrees. Keep your strokes short and in the direction of your turn, keep kicking, and arc you body around the buoy. Over emphasizing the turn like this makes it easier in a race—and it’s fun too! You could save as much as 18 to 25 percent of your energy swimming in open water by drafting efficiently and effectively. This means you could save up to 90 seconds over 1900m, or three minutes over 3.8km! By swimming in someone’s wake who is slightly faster than you, you’ll save quite a bit of your energy in open water, enabling you to swim faster than you would normally. Practicing swimming in close proximity to others will ensure you get used to this feeling. There are two methods of drafting, one where you position yourself about 12 inches behind the swimmer’s feet, and the other where you swim close to the lead swimmer’s hip. Make sure you keep sighting in each position. Don’t necessarily trust that the swimmer you’re drafting is navigating perfectly. However, by drafting effectively, you can significantly reduce your oxygen uptake, heart rate, blood lactate, and rate of perceived exertion. Additionally, your stroke length is dramatically increased when in an ideal drafting position. 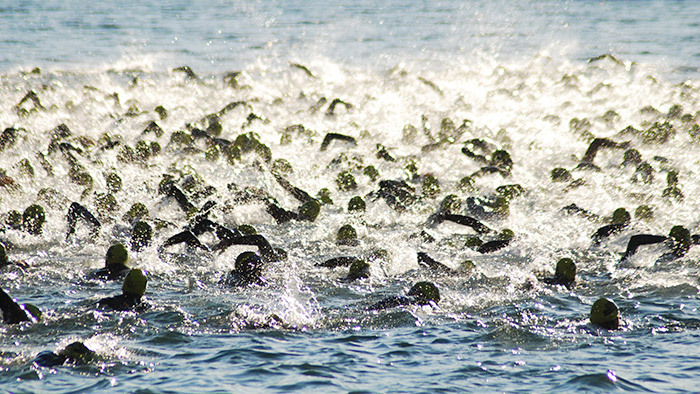 Does a feeling of panic start to overcome you when you think about open water mass starts? There are several things you can do to manage these fears. Position yourself in the pack so you breathe toward the group. For example, if you normally breathe in a race to your right, start on the far left hand side. This way you’ll be out of the melee of the main group, and in your own space more. Float horizontally in the water prior to the start so you can get the best send off when the gun goes. This also gives you more space around you than a deep water “legs down” start position, limiting people swimming on top of your legs. If you don’t want to be a part of all those flying arms and legs, then plan your escape route before the race starts. Don’t start in the middle of the front. Start at the back, where nobody else will really want your space in the water. Swimming in a wetsuit can give you between a seven and 10 second improvement over 100m than swimming without one. Also, as you go higher up the product range, the available technology helps you to swim faster and stay more stable and higher in the water. The overall savings can be as high as two minutes for an IRONMAN swim, (The test group for this study were all tested with Race Zone 3 wetsuits, at the same heart rate, and perceived effort of exertion on the same size loop in a lake). Practicing drills which make you feel slightly disorientated in the pool are very useful for distraction control and maintaining your rhythm and tempo when swimming in a race. This way you can also be accustomed to getting bumped about by other triathletes swimming in close proximity to you. The sea can present many different challenges to your normal swim stroke. For example, in choppy water, if you keep your fingers just above the surface of the water, then you are quite likely to have an unexpected wave come along and cause your hand to enter the water below your shoulder. In order to allow a reasonable stroke, you need to have a much higher recovery with your hand in open water. Sighting in swell: You would have no doubt seen in the Olympics open water race, it a slightly different technique to sighting in flat water. Due to the size of the swell you’ll either need to lift your head higher, or sight on the crest of the wave. If it’s choppy be prepared to sight more, as the currents can move you around more than normal. Navigation: Sight on something that’s high if you can, or if swimming parallel to the beach, sight horizontally as well as forward to maintain your position. Bilateral breathing: It’s recommended to be able to breathe bilaterally while swimming in the sea, for two reasons. One is for making sure you hold your position in a group and to make sure the currents are not moving you around too much. Two, if you’re swimming a rectangular course and the swell is high, then sighting toward the beach going out and back, will stop you from swallowing lots of water— if you’re breathing in toward a wave rather than from away from it. Drafting in currents: If there is a current pulling you away from the first buoy, try angling yourself into the current more. So if the current pulls you to the right, swim more over to the left about 30 degrees, so you’ll then be drifting in an arc to the right spot to turn next to the buoy. Wading: Running in the water up to knee height, by flicking your feet out laterally and your knees inward slightly. Doing this will help you to run and keep your feet clear of the sea water and waves. This is much quicker than swimming at this depth. Dolphining: To get past the breaking waves, it’s best to use a dolphining technique. This involves a mixture of a butterfly swim technique, with launching yourself into a dive, touching the sea bed / sand with your hands and then pushing yourself back up again into a dive. Only do this until the water is about waist deep, after this it’s best to start swimming normally. Beach starts: You can have a lot of fun with this next exercise as long as you have a safe beach entry for practice. Be sure to check for submerged objects that you might not have otherwise seen when entering for your warm-up. If you’re with friends, divide yourself up into pairs and label yourself one and two while standing on the beach looking out to the water. Upon the command “Go!” attempt a safe beach entry into the open water using wading and porpoising skills. Once you are deep enough, swim 40 strokes away from shore before turning and swimming back fast to the beach, making sure you avoid any head-on collisions with any other swimmers in the process. Run up onto the beach and tag your partner. Let them do the same 40 strokes before you take over again and then each do 30 strokes, then 20 strokes, then 10 strokes. By applying these small, one-percent gains from every aspect of your swimming technique, they can all add up to something fundamentally larger than the original whole you once knew as your swimming stroke! Let’s see how much we can help you improve your swimming technique and fitness over the next few months, so you can have the best swimming season yet. For more speedy swimming tips, visit my speedy swimming training plans in the TrainingPeaks Training Plan Store.